Simple Acts to Save Our Planet shows you how to be more active in saving our planet every day by performing some “Simple Acts of Kindness”—for the Earth. Treat the environment with kindness with these easy, manageable activities that range from simple home updates, to gardening basics, to supporting the local community. You’ll learn simple techniques to help protect the planet every day, like starting a compost pile to reduce food waste, utilizing travel mugs and reusable containers, and choosing eco-friendly products. By working to implement these simple strategies into your everyday life, you can take an active stand to protect the environment now— and make a real difference for the future. Michelle Neff currently writes for One Green Planet, the leading publishing platform on environmental issues. She resides in Asheville, NC with her husband and two rescue dogs. "Michelle Neff's new book outlines easy ways for us to perform simple acts of kindness for our earth, with manageable activities that range from simple home updates, to gardening basics, to supporting the local community." "The author of a new book about protecting the planet is encouraging us to think ‘simple.’ Simple Acts to Save Our Planet provides 500 easy-to-accomplish feats that are kind to the environment. Many of the recommendations may be incorporated almost effortlessly into a daily routine." "A great collection of advice … .The author seems to understand that many people need to take it in baby steps … this is the beauty of the book and why I think Simple Acts to Save Our Planet is the perfect gift for just about anyone who cares about the future of our planet!" "The next time you need to buy something special, though, whether it be for a birthday, anniversary, or holiday, consider channeling the Earth Day spirit with an intentional gift that inspires good stewardship of the planet we call home. 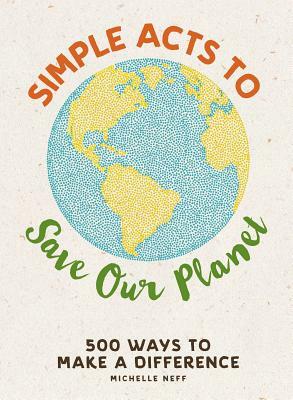 For some handy tips, pick up a copy of Michelle Neff’s Simple Acts to Save Our Planet: 500 Ways to Make a Difference. Each page offers up the perfect entrée into a more eco-conscious lifestyle." "Writer and environmentalist Michelle Neff offers 500 simple, straightforward ideas for living a greener life in her new book, Simple Acts to Save Our Planet … showing that by syncing up with other members of your community, you can magnify your power as a steward of the earth. These are the basic steps that should be part of everyone’s environmental practice." "Do you believe in being “green?” Then Simple Acts to Save Our Planet is for you. For those who want to do better, there are plenty of ideas … This might be a nice little gift for someone starting their own home for the first time, or for a teenager who wants to make an impact but doesn’t really know how."